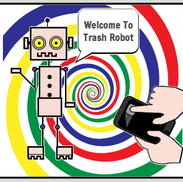 ← How can I help make a Trash Robot? I just noticed you have reset the page. My heads spinning, what going on? Is everything OK? I have been experiencing problems myself with bots joining site. Do you think there is something wrong with this new WordPress. I notice a lot of people are trying to make really big websites with loads of users. Most of them are just robots. I am willing to work with you to get to the bottom of this. If you need any help just contact my secretary Penelope. She has more answers than me. They putting me back in the box now, lets speak soon. Thanks for support Joe. Did you receive an email from the yellow optin Box?